Despite rumours that it would be so – especially with J.J. Abrams producing – Overlord is NOT, I repeat NOT, a secret new Cloverfield movie. I don’t know where those rumours emerged from, but anyone who read them when news of this movie first emerged needs to know that what they think they’re getting is definitely not what this film actually is. So there you have it, folks; Overlord is NOT linked in any way to the Cloverfield universe. And thank God, because this movie is so much fun on its own two feet that to unnecessarily link it with Abrams’ supposedly ongoing anthology series would have crippled it somewhat, drawing attention away from how this is a seriously entertaining action-horror extravaganza that gives you everything you could ask for from a wartime Nazisploitation movie call-back, from tons of bloodshed to evil Nazi experiments, and delivers one hell of a fun experience in the process. Set in 1944, as the Allies are making their way to Europe for the D-Day landings, a group of American soldiers are given a simple task: infiltrate a small French village where the Germans have built a radio tower that could hinder the invasion from being a success, and destroy it before the troops land. After being blown out of the sky by the enemy, all that remains of the soldiers – led by de facto commander Ford (Wyatt Russell, channelling his father Kurt greatly here) – head to the village with little time left to complete the mission. But upon arriving, they realise that in the nearby church, the Nazis are conducting a series of freaky experiments on the townspeople, in the hope of creating a super-strengthened army to help win the war, and the soldiers’ mission soon becomes about making sure that never happens. After seeing this film, I checked out a couple of other responses online, and one of them felt slightly underwhelmed because the horror element doesn’t kick in until much later. My immediate response was confusion, as I felt that the horror of it all was established in the very first sequence. Set on the plane that the soldiers are travelling on, which is them promptly blown to pieces as it flies through heavy gunfire, this entire opening is a firm reminder that the biggest, and scariest, serial killer in all of history, is war; it is bloody, loud, intense, and absolutely frightening all at the same time, with bullets flying up through the plane and into several unsuspecting soldiers, all as the plane jerks left and right to avoid being shot and disorientating them even further, and as the deafening sounds of the plane and the gunplay going on outside of it add up to something even more confusing and even terrifying. Even when they escape, the horror doesn’t end there; soldiers are hanged from the trees by their own parachute ropes, people get blown up by hidden mines right in the middle of a conversation, and of course there’s the threat of running into one or more Nazis right there and then. It’s an incredibly visceral and suspenseful way to open this kind of movie, which only proceeds to get more insane from there, and while I’m not saying it’s immediately on par with, say, the opening to Saving Private Ryan (also set during the D-Day landings, funnily enough), I am saying that the film certainly establishes its horror pretty early on with this entire sequence, contrary to what those other people online may have said about this film. Admittedly, it does take a little while for the movie to unveil its freakier nature, outside of just showing how cruel and unforgiving war can be, but once it makes it there – after a little while of getting to know some of these characters, including likeable young recruit Boyce (Jovan Adepo), French village girl Chloe (Mathilde Ollivier), and an utter slime-ball of a Nazi officer Wafner (Pilou Asbæk), and that’s putting it mildly – the film becomes an extremely entertaining, and especially gory, bonkers B-movie that I’m surprised wasn’t made in the 70s or 80s when Nazisploitation movies were in demand. Director Julius Avery brings a demented sense of fun to scenes of our heroes piling Nazis with endless bullets, blowing them up, and in one satisfying case setting them alight with a flamethrower, and he is working from a script by Billy Ray and Mark L. Smith that mercifully knows exactly what kind of movie it is, and delivers everything that it promises without acting all high and mighty about it. Even though it does contain some stock war tropes, certain stereotypes and a noticeable lack of any true surprises (the latter being especially noteworthy as this is a J.J. Abrams-produced movie, a man that delights in throwing about secret reveals not seen in any of the trailers), there is a real sense of fun that is evident in the people that are making this movie, from the actors to the director to the cinematographers to the editors, that is more than projected onto the audience, which has come to see things blow up, Nazis get shot at, and additional instances of gore and body horror, and are going to get all of that in a movie designed for a late-night crowd in the best way possible. While I thought Overlord was a very entertaining movie with tons of fun and horror to its name, I wouldn’t go so far as to say that this is one of the year’s best films; it’s certainly one of the more enjoyable, but when it comes to proper credentials, at the end of the day this is a B-movie that happened to do its job extremely well. 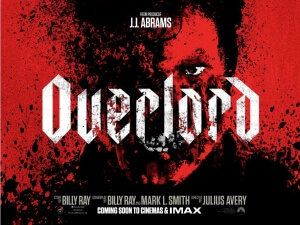 I would personally class Upgrade as an overall better movie than this, only because it took a lot more leaps outside the box with a bit more story and intelligence, but Overlord was a film I enjoyed quite a lot, and I wouldn’t mind seeing it again with an audience pretty late at night, just to hear them react to the insane but extremely entertaining things that happen in this awesome movie. Overlord is an incredibly entertaining and gory wartime B-movie which knows exactly what it is and delivers what the audience expects from it in a fun and visceral way that ensures they have a good time watching the madness unfold.